install the position of the current trend direction, it is commonly practiced by trend traders. However, if a trend increases or decreases too sharply in a short time, you must be vigilant. Because it could be in that period the price suddenly reverses against the position. As a result SL is touched and you suffer losses. 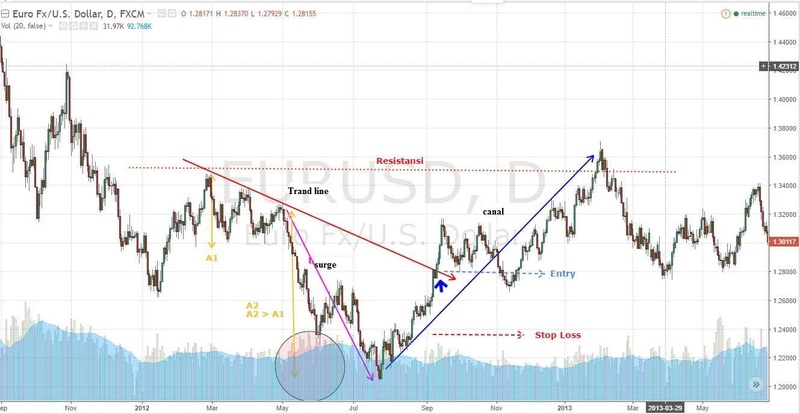 Well, so that you are more alert in anticipating a reversal, here is an analysis of price action patterns as a solution. 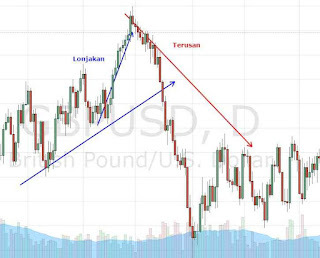 Spike and Canal Pattern (Bump and Run Reversal or BARR) is a pattern of formation to detect a possible reversal at the end of the trend. The strength lies in the simplicity of the pattern and its accuracy. Unfortunately, this pattern can only be seen clearly in certain market conditions, so the application can be rare. 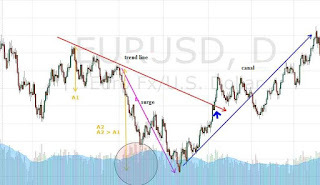 Visually, the pattern of surges and canals is named in such a way because the signal of the first price pattern is a sharp price surge when the trend is running. While the canal pattern is a reversal from the previous pattern. So the basic logic is, if a sudden surge occurs, the next market reaction is a relatively strong reversal of prices. The first step, you must pay attention to the degree of slope of the initial trend before a pattern of spikes occurs. The ideal slope of the trend is between 30 to 45 degrees. The second step, the slope of the surge pattern should be between 45 to 60 degrees. If the slope is less than this limit, then obviously the validity will also decrease. One key to the accuracy of the reversal signal of this pattern is trading volume. Monitor changes in trading volume when the trend is running. Usually a spike pattern will form when trading volume increases. Reversal signals can be confirmed with a pattern of surges and canals if prices have broken the trend line. This pattern can be found in all kinds of time frames. It's just that formation formation will be easier to find on a daily time frame because the trend takes place more consistently than at a low time frame. 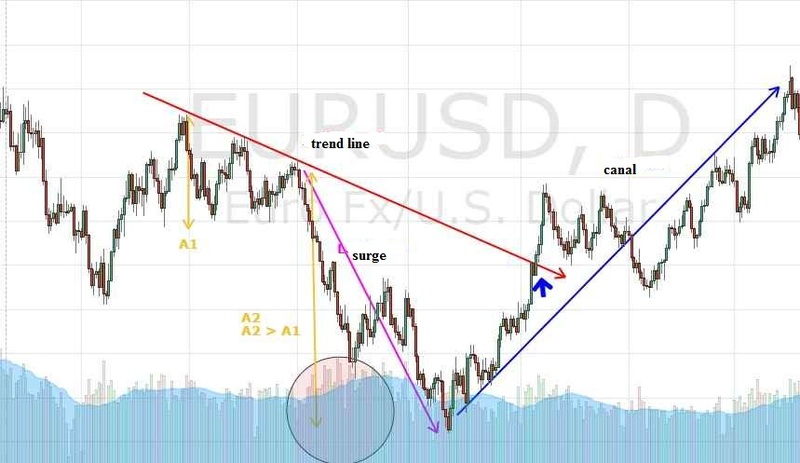 Here is an example of a Bearish surge and canal pattern on the EUR / USD pair with the daily timeframe. Note that the bearish trend has a slope of around 30 degrees. When trading volume increases (red circle), a spike pattern begins to form. Next, you can prepare the entry position when the price experiences a reversal and breaks the trend line. 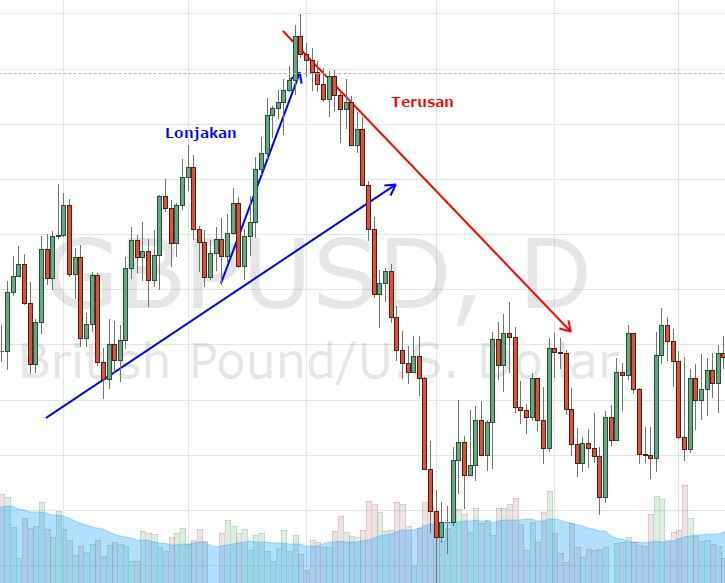 LEARN TO What Is Forex Drawdown? As for the Stop Loss (SL) position, you can place it between the tip of the surge pattern and the entry position. Well, regarding take profit (TP), the surge and canal pattern does not provide a specific exit signal. So that the reference to put TP can be flexible according to circumstances. For example in the picture above, the position of TP is taken from the resistance limit.